Can we have a single north pole, or a single south pole? No, we cannot have a single north or south pole. Magnetic poles are always found in pairs. They are equal in strength and opposite in nature. Even if we break a magnet into a number of pieces, each piece will become a magnet with equal and opposite poles. Do two distinct poles actually exist at two nearby points in a magnetic dipole? No, two distinct poles cannot exist at two nearby points in a magnet, as a magnet contains only two distinct poles located at its ends. An iron needle is attracted to the ends of a bar magnet but not to the middle region of the magnet. Is the material making up the ends of a bare magnet different from that of the middle region? No, the material making up the middle region of a magnet is the same as that of the material making up its end. When an iron needle is taken closer to one of the ends of a magnet, the pole of the magnet induces a pole of opposite polarity on the needle, making the needle a magnet itself and thereby making it attracted to that pole. But if we bring the needle closer to the centre of the magnet, then both the poles of the magnet will induce opposite polarity on the needle. As a result, the needle will not get attracted towards the centre of the magnet. 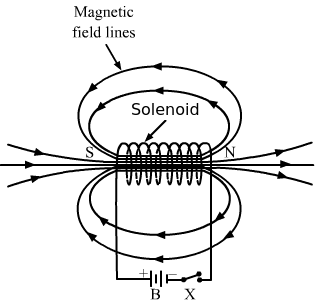 Compare the direction of the magnetic field inside a solenoid with that of the field there if the solenoid is replaced by its equivalent combination of north pole and south pole. The direction of the magnetic field is the same in both cases, that is, inside a solenoid and inside a bar magnet. 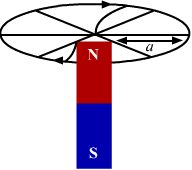 In a solenoid, magnetic field lines are directed from one end to the other internally and externally, so they are in the equivalent combination of north and south poles (as shown in figure). Sketch the magnetic field lines for a current-carrying circular loop near its centre. Replace the loop by an equivalent magnetic dipole and sketch the magnetic field lines near the centre of the dipole. Identify the difference. The difference between the two configurations is that in the current-carrying loop, the magnetic field lines pass through the centre and are perpendicular to its axis; whereas in the equivalent magnetic dipole, the magnetic field lines do not pass through the centre. B→. Does it contradict our earlier knowledge that a magnetic field can exert forces only perpendicular to itself? Yes, it seems to contradict with our earlier knowledge that a magnetic field can exert forces only perpendicular to itself. For a positive magnetic charge, force is along the magnetic field. For a negative magnetic charge, force is opposite to the magnetic field. Two bar magnets are placed close to each other with their opposite poles facing each other. In absence of other forces, the magnets are pulled towards each other and their kinetic energy increases. Does it contradict our earlier knowledge that magnetic forces cannot do any work and hence cannot increase kinetic energy of a system? Yes, it contradicts our earlier knowledge that magnetic forces cannot do any work and hence cannot increase the kinetic energy of the system. When opposite poles are facing each other, an attractive force acts between them so the magnets are pulled towards each other. As the two magnets come close to each other so the force between them increases and hence, the kinetic energy also increases. r→2=r→1. Can we have a magnetic scalar potential in this case? No, we cannot have a magnetic scalar potential here. Ampere’s law is a method of calculating magnetic field due to current distribution. On the other hand, magnetic scalar potential requires a magnetic field due to pole strength m.
μ0m4πrAs there is no current distribution, no magnetic field due to poles or the pole strength is present. That is why we cannot have a magnetic scalar potential in this case. Can the earth’s magnetic field be vertical at a place? What will happen to a freely suspended magnet at such a place? What is the value of dip here? Yes, Earth’s magnetic field is vertical at the poles. A freely suspended magnet becomes vertical at the poles, with its north pole pointing towards Earth’s north pole, which is magnetic south. The value of the angle of the dip here is 90°. Can the dip at a place be (a) zero (b) 90°? (a) Yes, the dip can be zero at the equator of Earth. (b) Yes, the dip can be 90°â€‹ at the poles of Earth. The reduction factor K of a tangent galvanometer is written on the instrument. The manual says that the current is obtained by multiplying this factor to tan θ. The procedure works well at Bhuwaneshwar. Will the procedure work if the instrument is taken to Nepal? If there is same error, can it be corrected by correcting the manual or the instrument will have to be taken back to the factory? BBH, where B is the external magnetic field and BH is the horizontal component of Earth’s magnetic field. Thus, we need not take the manual or the instrument back to the factory for correction. Points lying on the axis of a magnet are called end-on points. In our case, the point on the axis of the loop (on replacing the circular loop with an equivalent magnetic dipole) lies on the axis of the magnetic dipole or on the end-on position. If P was the point on the axis of the loop, then it is clear from the figure that P lies on the end-on position of the equivalent magnetic dipole. The position of the points lying on the equator of a magnetic dipole is called the broadside-on position. In our case, the point on the loop (after replacement of the circular loop with an equivalent magnetic dipole) lies on the equatorial position of the equivalent magnetic dipole. Hence, the point lies on the broadside-on position. If P was the point on the loop, then it is clear from the figure that point P lies on the broadside-on position of the equivalent magnetic dipole. When we replace a circular current-carrying loop with a magnetic dipole to resemble field lines of the circular loop, the pole strength m and the distance between the poles are not fixed. But the magnetic dipole moment of both systems is always fixed. It is the product of the magnetic moment and the distance between the poles. In other words, md is fixed. A current loop of area A and current I can be replaced with a magnetic dipole of dipole moment md. Here, 2l is the length of the magnet. B=μ02Mr4πr2-l22Here, 2l is the length of the magnet. ∝ 1r3Now, l in the denominator can be neglected. Magnetic meridian at a place is not a line but a vertical plane passing through the axis of a freely suspended magnet. When taken to a geomagnetic pole, a compass needle that is allowed to move in a horizontal plane will try to suspend itself vertically to the horizontal plane containing the compass. In other words, the horizontal plane containing the compass will restrict the compass to suspend itself in vertical direction; hence, the compass will stay in any position. However, a freely suspended magnet will become vertical at poles, with its north pole pointing towards Earth at its north pole (which is magnetic south). At the geomagnetic equator, the needle tries to suspend itself in horizontal direction. But here the needle is restricted to move only in the vertical plane perpendicular to the magnetic meridian. Hence, the needle will stay in the direction it is released. Which of the following four graphs may best represent the current-deflection relation in a tangent galvanometer? θ, the only graph that represents this correlation is curve c.
Here, k is the constant called reduction factor. From the above formula, we can say that deflection is independent of the number of turns. Hence, on doubling the number of turns, deflection remains the same. i=knABθ ⇒i∝θTherefore, if we double the current, the deflection also gets doubled. In this case, the north pole of the magnet is coinciding with the centre of the circular loop carrying electric current i. So, the magnetic field lines almost lie on the plane of the ring and the force due to the field lines is perpendicular to the field lines and to the plane of the circular ring. Let idl be the current element, B be the magnetic field and dF be the force on the current element idl. πaiB and it is perpendicular to the plane of the wire. (b) A north pole is equivalent to a clockwise current and a south pole is equivalent to an anticlockwise current. (d) A bar magnet is equivalent to a long, straight current. (a) Magnetic field is produced by electric charges only. (b) Magnetic poles are only mathematical assumptions having no real existence. Investigators and experimenters have failed to find any sign of magnetic monopoles. So, we can assume that magnetic monopoles are only a mathematical assumption. A magnetic field is produced by the motion of an electric charge only. In paramagnets or ferromagnets, the motion of an electron (charge) and the alignment of domains (bunch of charges with particular alignment) create paramagnetism and ferromagnetism, respectively. Therefore, the only cause behind the magnetic field is the motion of an electric charge. The north pole is equivalent to an anticlockwise current and the south pole is equivalent to a clockwise current. 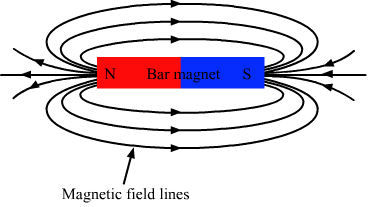 A bar magnet is not equivalent to a long, straight current because the distribution and orientation of magnetic field lines do not resemble each other. A horizontal circular loop carries a current that looks clockwise when viewed from above. It is replaced by an equivalent magnetic dipole consisting of a south pole S and a north pole N.
(a) The line SN should be along a diameter of the loop. (d) The north pole should be below the loop. A horizontal circular loop carrying current in clockwise direction acts like the south pole of a magnet. Hence, the south pole of the magnet coincides with the loop. Now, when the loop carrying current in clockwise direction is viewed from above, it looks like the magnetic lines of force are entering the loop thus it acts like south pole of a magnet. And if we view from below the loop then it appears that magnetic lines of force are leaving the loop. Hence, the north pole should be below the loop. →Bis the same only at points P1 and P2 and at points Q1 and Q2. →Bis opposite at points P1 and Q1 and at points P2 and Q2. Tangent galvanometer is an instrument used to measure electric current; it cannot be used to the measure magnetic moment of a bar magnet. MBH of a permanent bar magnet. Similarly, oscillation magnetometer is used to measure M BH of a bar magnet. So, if earth’s horizontal field, BH, is known, then the magnetic moment of a bar magnet, M, can be measured. MBH × M BHâ€‹ = M2. Thus, the value of BH is not required. Therefore, we can use both deflection and oscillation magnetometers if the earth’s horizontal field is not known. A long bar magnet has a pole strength of 10 Am. Find the magnetic field at a point on the axis of the magnet at a distance of 5 cm from the north pole of the magnet. 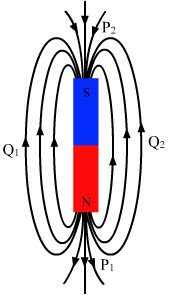 Two long bare magnets are placed with their axes coinciding in such a way that the north pole of the first magnet is 2.0 cm from the south pole of the second. If both the magnets have a pole strength of 10 Am, find the force exerted by one magnet of the other. A uniform magnetic field of 0.20 × 10−3 T exists in the space. Find the change in the magnetic scalar potential as one moves through 50 cm along the field. Since the magnetic field is uniform, it can come out of the integration sign. ∆Vis the change in the potential. Here, the negative sign shows that the potential decreases. Figure (36-E1) shows some of the equipotential surfaces of the magnetic scalar potential. Find the magnetic field B at a point in the region. B=-dVdx⇒B = -0.1×10-4 T-m5×10-2 m ⇒B = -2×10-4 TB is perpendicular to the equipotential surface. Here, it is at angle of 120° with the positive x-axis. The magnetic field at a point, 10 cm away from a magnetic dipole, is found to be 2.0 × 10−4 T. Find the magnetic moment of the dipole if the point is (a) in end-on position of the dipole and (b) in broadside-on position of the dipole. tan-1 2with the magnetic axis. Hence, the magnetic field due to the dipole is perpendicular to the magnetic axis. A bar magnet has a length of 8 cm. The magnetic field at a point at a distance 3 cm from the centre in the broadside-on position is found to be 4 × 10−6 T. Find the pole strength of the magnet. B=μ0m2l4πd2+l23/2Here, m is the pole strength of the magnet. A magnetic dipole of magnetic moment 1.44 A m2 is placed horizontally with the north pole pointing towards north. Find the position of the neutral point if the horizontal component of the earth’s magnetic field is 18 μT. We know that for a magnetic dipole with pole pointing to the north, the neutral point always lies in the broadside-on position. Let d be the perpendicular distance of the neutral point from mid point of the magnet. B→ = μ0M4πd3This magnetic field strength should be equal to the horizontal component of Earth’s magnetic field at that point, that is, BH due to Earth. A magnetic dipole of magnetic moment 0.72 A m2 is placed horizontally with the north pole pointing towards south. Find the position of the neutral point if the horizontal component of the earth’s magnetic field is 18 μT. â€‹Let d be the distance of the neutral point from the south of the dipole. When the magnet is such that its north pole faces the geographic south of Earth, the neutral point lies along the axial line of the magnet. B=μ04π2Md3This magnetic field strength should be equal to the horizontal component of Earth’s magnetic field. 0.722 A m2is placed horizontally with the north pole pointing towards east. Find the position of the neutral point if the horizontal component of the earth’s magnetic field is 18 μT. Let d be the distance of neutral point from the dipole. The magnetic moment of the assumed dipole at the earth’s centre is 8.0 × 1022 A m2. Calculate the magnetic field B at the geomagnetic poles of the earth. Radius of the earth is 6400 km. The geomagnetic pole is at the end of the position (axial) of Earth. If the earth’s magnetic field has a magnitude 3.4 × 10−5 T at the magnetic equator of the earth, what would be its value at the earth’s geomagnetic poles? Let M be the magnetic moment of Earth’s magnetic dipole and R be the distance of the observation point from the centre of Earth’s magnetic dipole. The magnetic field due to the earth has a horizontal component of 26 μT at a place where the dip is 60°. Find the vertical component and the magnitude of the field. tan-1 23with the horizontal, what would be the dip at that place? The needle of a dip circle shows an apparent dip of 45° in a particular position and 53° when the circle is rotated through 90°. Find the true dip. A tangent galvanometer shows a deflection of 45° when 10 mA of current is passed through it. If the horizontal component of the earth’s magnetic field is BH = 3.6 × 10−5 T and radius of the coil is 10 cm, find the number of turns in the coil. Number of turns in the coil, n = ? A moving-coil galvanometer has a 50-turn coil of size 2 cm × 2 cm. It is suspended between the magnetic poles producing a magnetic field of 0.5 T. Find the torque on the coil due to the magnetic field when a current of 20 mA passes through it. A short magnet produces a deflection of 37° in a deflection magnetometer in Tan-A position when placed at a separation of 10 cm from the needle. Find the ratio of the magnetic moment of the magnet to the earth’s horizontal magnetic field. Let M be the magnetic moment of the magnet and BH be Earth’s horizontal magnetic field. The magnetometer of the previous problem is used with the same magnet in Tan-B position. Where should the magnet be placed to produce a 37° deflection of the needle? MBH=4πμ0d2+l23/2 tan θSince for the short magnet l << d, we can neglect l w.r.t. d.
MBH=4πμ0d3 tanθ⇒3.75×103=110-7×d3×0.75⇒d3=3.75×103×10-70.75 =5×10-4⇒d=5×10-43⇒d=0.079 m=7.9 cmMagnet will be at 7.9 cm from the centre. A deflection magnetometer is placed with its arms in north-south direction. How and where should a short magnet having M/BH = 40 A m2 T−1 be placed so that the needle can stay in any position? MBH = 40 Am2/TSince the magnet is short, l can be neglected. MBH=4πμ0d32=40⇒d3=40×10-7×2⇒d3=8×10-6⇒d=2×10-2 m=2 cmThus, the magnet should be placed in such a way that its north pole points towards the south and it is 2 cm away from the needle. A bar magnet takes π/10 second the complete one oscillation in an oscillation magnetometer. The moment of inertia of the magnet about the axis of rotation is 1.2 × 10−4 kg m2 and the earth’s horizontal magnetic field is 30 μT. Find the magnetic moment of the magnet. The combination of two bar magnets makes 10 oscillations per second in an oscillation magnetometer when like poles are tied together and 2 oscillations per second when unlike poles are tied together. Find the ratio of the magnetic moments of the magnets. Neglect any induced magnetism. A short magnet oscillates in an oscillation magnetometer with a time period of 0.10 s where the earth’s horizontal magnetic field is 24 μT. A downward current of 18 A is established in a vertical wire placed 20 cm east of the magnet. Find the new time period. When a current-carrying wire is placed near the magnet, the effective magnetic field gets changed. Now the net magnetic field can be obtained by subtracting the magnetic field due to the wire from Earth’s magnetic field. T=2πIMBHLet T1 and T2 be the time periods of the coil in the absence of the wire and in the presence the wire respectively. A bar magnet makes 40 oscillations per minute in an oscillation magnetometer. An identical magnet is demagnetized completely and is placed over the magnet in the magnetometer. Find the time taken for 40 oscillations by this combination. Neglect any induced magnetism. Now, let T2 be the time period for which the second demagnetised magnet is placed over the magnet. As the second magnet is demagnetised, the combination will have the same values of M and BH as those for the single magnet. However, variation will be there in the value of I on placing the second demagnetised magnet. A short magnet makes 40 oscillations per minute when used in an oscillation magnetometer at a place where the earth’s horizontal magnetic field is 25 μT. Another short magnet of magnetic moment 1.6 A m2 is placed 20 cm east of the oscillating magnet. Find the new frequency of oscillation if the magnet has its north pole (a) towards north and (b) towards south. Now, let B be the magnetic field due to the short magnet.